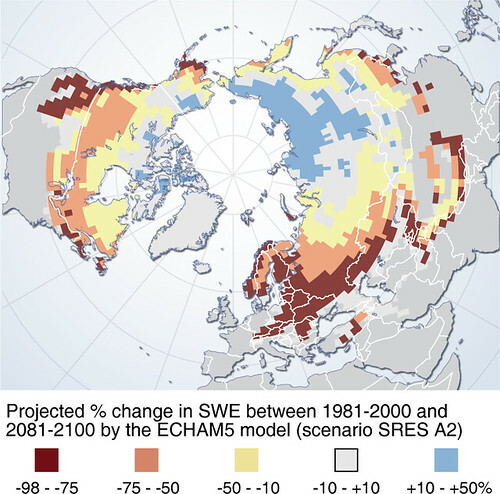 Using one specific climate change model (ECHAM5) and the SRES A2 emission scenario (run 2) the projected loss of snow amounts to decreases of 60–80 per cent in monthly maximum snow water equivalent over most middle latitudes by the end of this century. The largest decreases are projected over Europe, while the model projects increases are in the Canadian Arctic and Siberia. Snow presents an important factor for ecosystems, water and human activities, and future changes in snow cover and snow extent will have important effects.